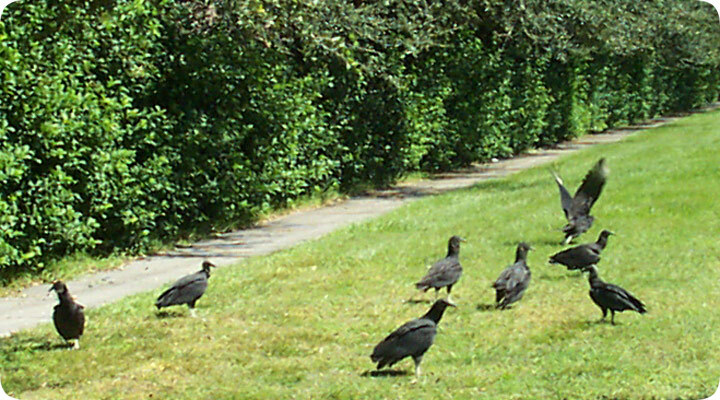 05.08.2007 - Vultures! Those harbingers of death! Those dark-caped masqueraders of the other world! Those connoisseurs of roadkill! Yes, vultures. These vultures in this photo are not Turkey Vultures Cathartes aura, but rather American Black Vultures Coragyps atratus which are more common in the south. They are congregating around an armadillo carcass for unknown reasons. Ha, I always wanted to say that. They are actually there to eat the armadillo carcass for the purposes of nutrition. When they eat the armadillo carcass, they will digest it, and then later on, they will poop. It is this poop, as it is with most birds, that can annoy people. So when vultures tend to roost in an area, they tend to make vulture poop there, and people don't take kindly to vulture poop, which is less appetizing than chocolate souffle. So in I march, with my lasers and pyrotechnics and water jets and such, and I scare those scary vultures away, off to the nether regions of the earth, where they can't bother decent folk again. Some people think the vulture is the ugliest looking bird on the planet. They evoke fear just by existing. They are scavengers as they will feed on dead carcasses. They have a bald head which helps them to keep clean when they are eating. Females are slightly larger than the male but other than that they look pretty much the same. They have brown and black colored feathers. There are flight feathers on the wings and they are silver-gray in color. Their heads are small compared to the rest of their bodies. A vulture is called a wake when they are in a group. To see one just sitting in a tree conjures up images of blood and gore and nothing but hatred for them. There is absolutely nothing cute about them and there is absolutely nothing that would be good to say about them except for the fact that they do help keep roadways clean of road kill. A vulture is found in the warm areas of North America. They have a really good sense of smell and they will circle over something before swooping down to catch it up and eat it. It has been known for a vulture to circle around something waiting for it to die. They also circle around trying to gain height in their flight. That is such a spooky and gory behavior and this doesn’t do much for their already tarnished reputation. They have been known to carry diseases such as anthrax or cholera. This also doesn’t help with their reputation. A vulture has hardly any natural predators. It is protected under the Migratory Bird Treaty Act in the United States. Why they are protected is anybody’s guess but even though they are ugly they have a right to live just like everything else. Several of them will join in a circle and they will perform a hopping movement around the circle. Their wings are partially spread open. This is all part of the courtship. They will lay their eggs in a nest on the side of a steep cliff, in a cave or a thicket. They generally don’t prepare a nest but will just lay their eggs on a hard surface. This isn’t surprising because of the fact that they are just cruel birds so for them to be cruel to the young ones, this kind of makes sense. A vulture will generally raise two babies and they are fed by regurgitation. Both parents help to incubate the eggs. It takes 30 or 40 days for the eggs to hatch. The vulture is very adept at flying. They can detect objects and dead animals by thermal. They urinate to keep cool and their urine is one of the most powerful disinfectants of all. They will also spray urine on their legs and this helps them kill off any germs or bacteria. Mites and other parasites would also be killed off with their urine. A vulture cannot see in the dark which means that they would hunt during the day.